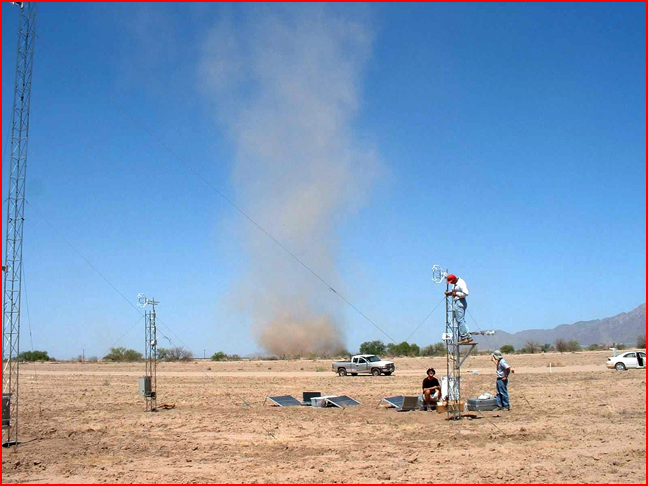 This is a picture of the 2001 MATADOR campaign in Arizona to measure electrical and magnetic activity in dust devils. Until scientists witnessed the unexpected behavior of colossal whirlwinds on Mars, they did not think to ask if electricity might be an important aspect of terrestrial dust devils or even of small whirlwinds. American philosopher Richard Rorty argued that cognitive revolutions aren’t about better ways to do the same old things but about ways to do something new. The assertion that a phenomenon has already been explained misses the point. New ideas make new phenomena; new visions see new worlds. Take the case of a whirlwind of dust that spins up in the lee of a building when the wind blows. It’s already been explained that varying speeds in airflows around the building generate eddies. The phenomenon can be described with a mathematical exactitude that enables engineers to predict the speeds and forces involved, and those predictions have been verified over and over. That the whirlwind is a mechanical event is obvious. This being so, it is impertinent to ask if electrical forces could be involved. Or is it? Have the experts actually considered the entire picture? Epistemology—the branch of philosophy that studies how we “know” things—matters a lot when it comes to new ideas, even if we pay little attention to epistemology in our practical activities. An examination of how we can be sure a whirlwind is really mechanical quickly reduces to a question of how sure we really can be. The mechanical explanation ignores many of the conditions from which whirlwinds arise. In fair weather, with no clouds in the sky, an electric field can be measured. It amounts to about 100 volts per meter. This field is coupled to a complex of “double layers” (plasma cells), currents, and circuits that reach through the atmosphere into the magnetosphere and even into interplanetary space. Water molecules, comprising up to 4 percent of the atmosphere, have the two hydrogen atoms toward one side of each molecule and the oxygen atom toward the other. This makes each molecule a tiny electrical dipole—a pair of oppositely charged poles—subject to electrical forces. Such polar molecules will tend to line up and stick together. In a cloud they will form a leaky dielectric, storing charge and responding to the vertical atmospheric electric field. Are these considerations important? Has anybody checked? The answer to both questions is “yes,” but the mob of scientists, who should know better, conforms to a consensus that ignores the questions. In response to some enigmatic observations of dust devils—giant whirlwinds—on Mars, some NASA scientists began taking electrical measurements around dust devils on Earth. They found large electrical fields with strengths 40 times that of the fair weather field. They assumed that the mechanical spinning of dusty air rubbed electrons off the dust grains and then somehow pulled the electrons to one end of the devil and the positive grains to the other. If the winds of a thunderstorm can’t separate charges, then the trivial breezes of a whirlwind certainly can’t! What if the electric field produces the whirlwind? We know the Earth is surrounded and interpenetrated by large and complex electric currents. We know currents in plasma—any substance that contains charged particles—form filaments that spiral around each other: Another word for “spiral around” is “whirl.” For most of the time we ignore those currents. But being attentive to them could generate the new ideas that enable us to see a new world. Jan 4, 2005—How’s the Weather?